I recently bought a couple of items from the Makeup Geek website with a friend. I ordered a NYX Butter Gloss and a Makeup Geek Loose pigment. I'm really happy with these two products so I thought I'd take this opportunity to show you my recent purchases as well as share my overall shopping experience and explain what it was like ordering from the UK. Makeup Geek is a website created by popular Beauty YouTuber and 'makeup educator', Marlena. She's created a line of makeup products that I've seen a lot of people raving about over the years. The eyeshadows in particular are very popular and I'm thrilled that I finally got the chance to put in an order and try something out from makeup Geek! 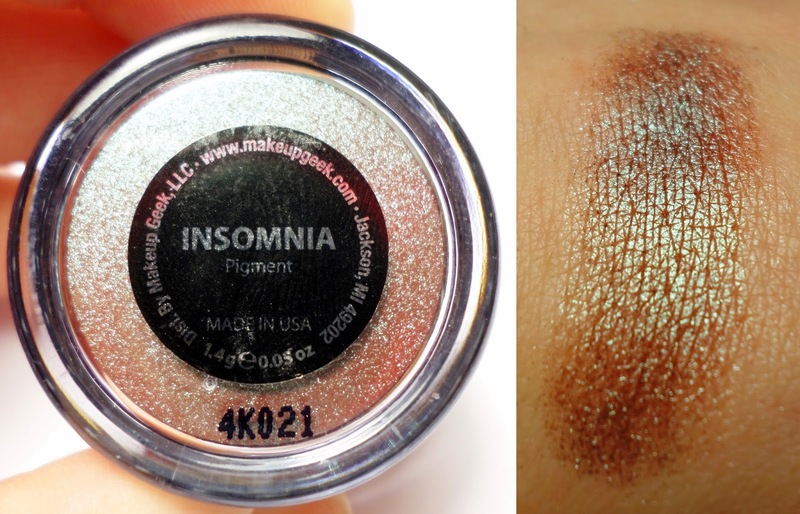 I picked up this Makeup Geek Loose Pigment in the shade Insomnia which is a dupe for Mac's Blue Brown Loose Pigment. - This dark chocolate colored pigment has sparkling blue/teal reflects and the duochrome effect simply means the color changes as you blend. It will appear as multiple colors, although you are using just one pigment. Its velvet-like texture makes it easily applicable, gliding on with ease. Use alone or with a wet brush to create a variety of different looks. - This Mauve shade is a Buttery lip gloss with a sweet scent that provides sheer to medium coverage with a non-sticky feeling. Can be used alone or over lipstick. Great for moisturised lips, a pop of colour and pearly shine. I ordered with a friend and we got 5 products (3 x Eyeshadow Pans, 1 x Loose Pigment & 1 x Butter Lip Gloss). Our order came to around $30 (about £20) and postage was $18 (about £12). Then we had to pay another $18 (about £12) in Customs Charges just to receive out package! Shipping was quick (within two weeks) and relatively inexpensive and delivery was via Royal Mail, requiring a signature on delivery. However, the unexpected Customs Charges really stung! As it turns out, any package sent to the UK with a value of £15 or more is subject to customs charges, so, please bear that in mind before ordering. I'm really happy with my purchases from Makeup Geek but in all honesty, I probably won't order anything from them again as I find the customs charges / import duty too costly. Of course, this isn't Makeup Geek's fault, it's just how international packages are currently charged here in the UK. My impression is that customs charges are a lot more expensive here than elsewhere in the world. Have you tried anything from Makeup Geek before? Do you watch Marlena's (a.k.a Makeup Geek's) videos on YouTube?